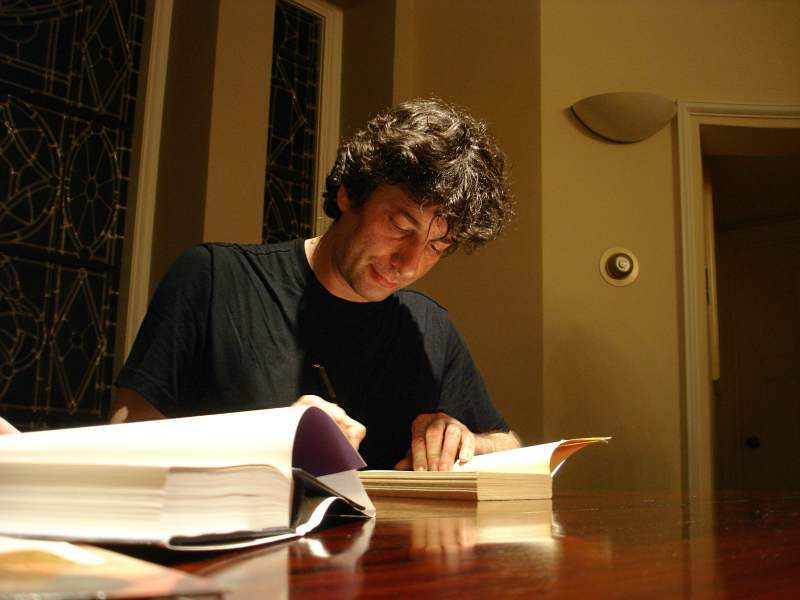 Image: Neil Gaiman, signing books after a reading from ‘Anansi Boys’ in Berkeley, 2005 © 2005 Jutta, share-alike licence. Great Gaiman quote, but it was, “This is how you do it: you sit down at the keyboard and you put one word after another until it’s done. It’s that easy, and that hard.” that got me through NaNoWriMo last year. Also, no Vonnegut? BTW, thanks for the like! It’s amazing how when seeing a blank piece of paper can reinforce your belief that if you have something to say, you buckle down and get on with it, and the words flow. I keep getting surprised by what I can do. Indeed – it’s the getting started that’s the tough bit! I think the main thing is just to start writing. Then you warm up, and it becomes easier. If you wait for something to come into your mind, you could wait a long time. Sometimes you have to will yourself to write and somehow words tend to follow, even if it’s one sentence at a time. And gradually the words start to flow and you’re back with the story. Reblogged this on Inside A Wallflower's Mind. Thanks – glad you liked them! They’re among my favourites too, though it’s tough to choose really (it was hard choosing the ten to go in this post, to be honest). The last by Thoreau is particularly relevant in the digital age. Reblogged this on William Grit. I love hearing the truth about writing from the certified profis, for the feeling of identification will probably be the only comparison one of us mere-mortals can honestly claim as a connection with them. Certainly Thomas Mann’s pronouncement is wondrous. Considering the length of his books, he suffered greatly! Reblogged this on The Birds Inside My Head…. That last quote really got me. I think why I find it hard to write sometimes is because I haven’t lived enough. Some fabulous Quotations on Writing. My godmother, Rosemary Sutcliff (1920-92), was an ‘impish, irreverent writer of genius’ according to The Guardian newspaper in the UK in their obituary. In the second half of the 20th century she was a major figure in children;s lierature and historical fiction. She was fascinating about the process of writing her books. I recently collated a few quotes of hers from an early 1980s article inThe Times newspaper. They are at http://rosemarysutcliff.com/2014/01/21/modern-times-are-a-hindrance, a post on the blog http://www.rosemarysutcliff.com . Other quotes from Rosemary Sutcliff can be found here at http://rosemarysutcliff.com/tag/quotes. I shall resist here trying ’10 Great Quotations from Rosemary Sutcliff’ about writing’! But I should perhaps have left this quote, on re-reading yours from Nora Ephron (‘I think the hardest thing about writing is writing”) . Rosemary Sutcliff once said: “Writing is perhaps just one degree less frightful than not writing”. I like another Neil Gaiman one: where is the fun in doing something you know will work? I loved this post, so I just had to reblog. I particularly like the quote by Thomas Mann. Thanks interesting Literature for the original. Neil Gaiman had such great advice on writing. Also, so does Stephen King. Hehe, I like that one! Ha ha, I know. Truth. It’s brilliant. Thanks for liking my quote! Hmm, the Thoreau quote is very profound – how can you write if you have not lived indeed? Wow, amazing quotes!! Thank you for sharing! Reblogged this on Virtual Book Tour. can understand it. Therefore that’s why this article is outstdanding. It doesn’t directly apply to writing, but I find it relevant. I wrote a post about it on my blog if anyone is interested!